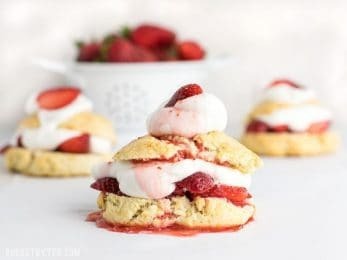 I’m usually terrible at desserts, unless it’s something insanely simple, like strawberry shortcake. Luckily, simple doesn’t mean unimpressive. 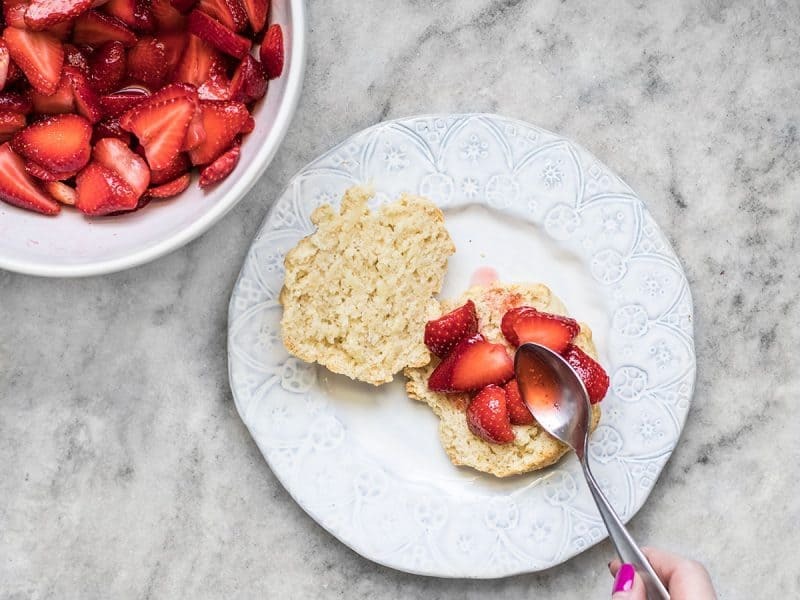 All you need to make these cute, instagram-worthy little strawberry shortcake stacks are a few pantry staples and the season’s best strawberries. So skip the over sugared candy-bar-stuffed-into-cake-topped-with-ice-cream-and-drizzled-with-chocolate-syrup type of over the top desserts that are all the rage right now, grab a pound of fresh strawberries, and make a dessert that is truly worth bragging about. Let those gorgeous strawberries do their thing and enjoy them while they’re here! 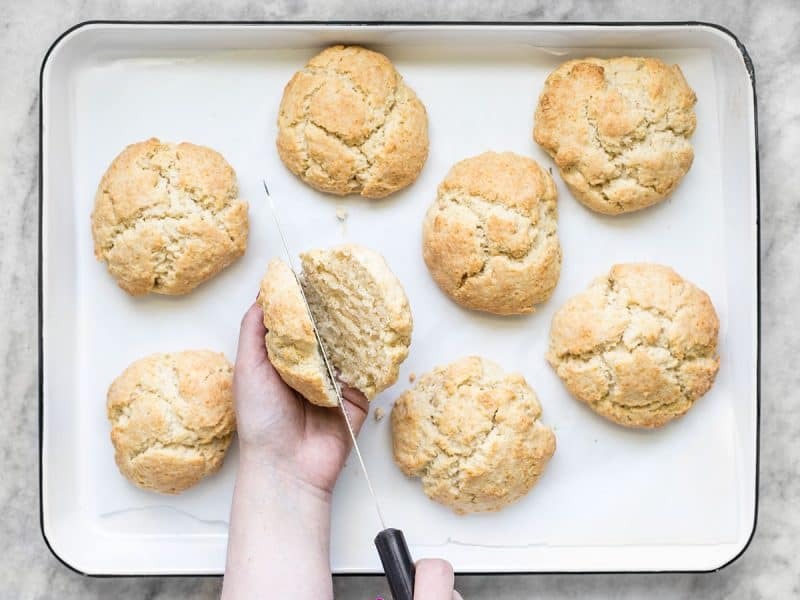 For the cake part of these shortcakes I actually just took my favorite 5-ingredient freezer biscuits, added a bit more sugar to make them dessert-like, and shaped them into a more rustic round shape. They worked perfectly for the strawberry shortcakes because of their super tender crumb that absorbed the strawberry syrup like a champ. And since I already had heavy whipping cream to make the biscuits, I decided to go ahead and make my own whipped cream, too. If you’ve never make your own whipped cream, you’ve got to give it a try. It’s surprisingly easy and tastes so much better than what you get in the tub or can. You can do it by hand with a whisk, or use a mixer if you don’t feel like working your triceps. Either way it takes all but three minutes. 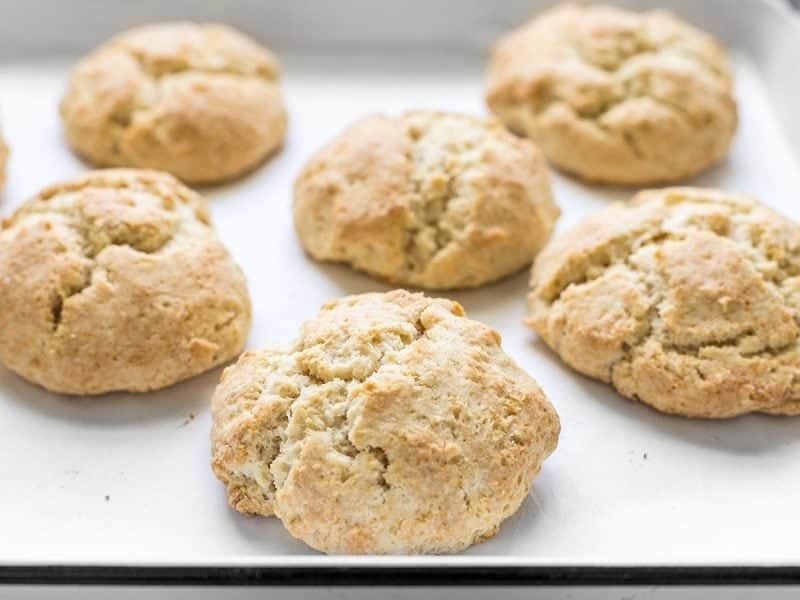 This recipe did make 8 biscuits and I think the strawberries and cream are only enough for about six, so save the extra two biscuits to top with butter and jam for breakfast. You can thank me later. Rinse the strawberries well, then remove the stems and leaves by scooping them out with a spoon. Slice the strawberries lengthwise into about four slices each. 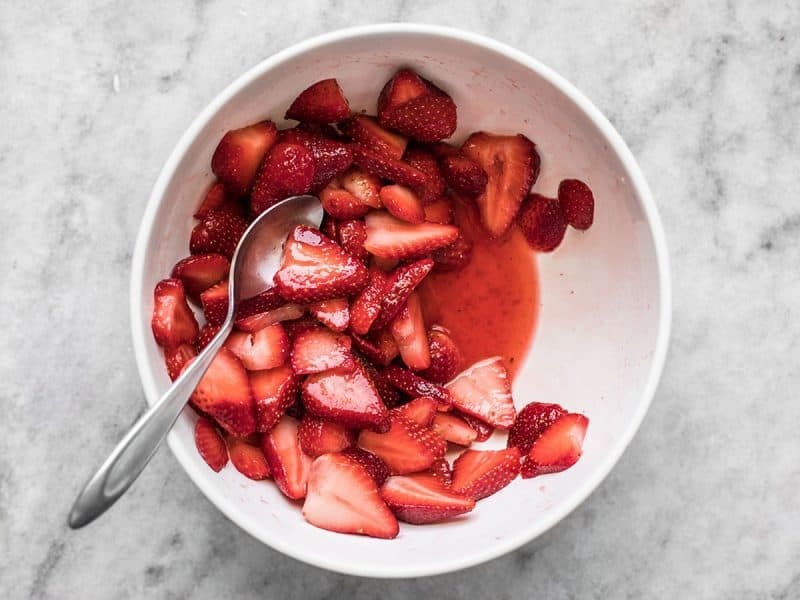 Place the sliced strawberries in a bowl, add 2 Tbsp sugar, stir, and set them aside. The sugar will draw out the juice from the strawberries as they sit and create a delicious strawberry syrup. Stir the strawberries occasionally as they sit. Begin to preheat the oven to 400ºF for the biscuits. Line a baking sheet with parchment paper. Stir together the flour, salt, sugar, and baking powder in a bowl until they are very well combined. 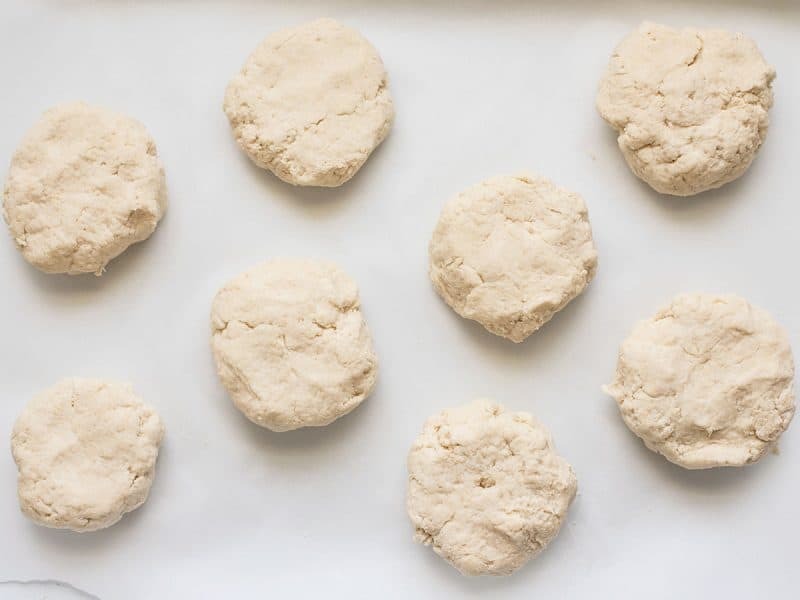 Dust your hands with flour, then divide the dough into eight pieces, and roughly shape the pieces into circles, about an inch to an inch and a half thick. Place the shaped biscuits onto the baking sheet. Bake in the preheated oven for about 25 minutes, or until they are lightly golden brown on top. Once the biscuits have baked, let them sit until they are cool enough to handle. Carefully slice the biscuits in half. Spoon some of the strawberries and strawberry syrup from the bottom of the bowl onto the bottom of each biscuit. 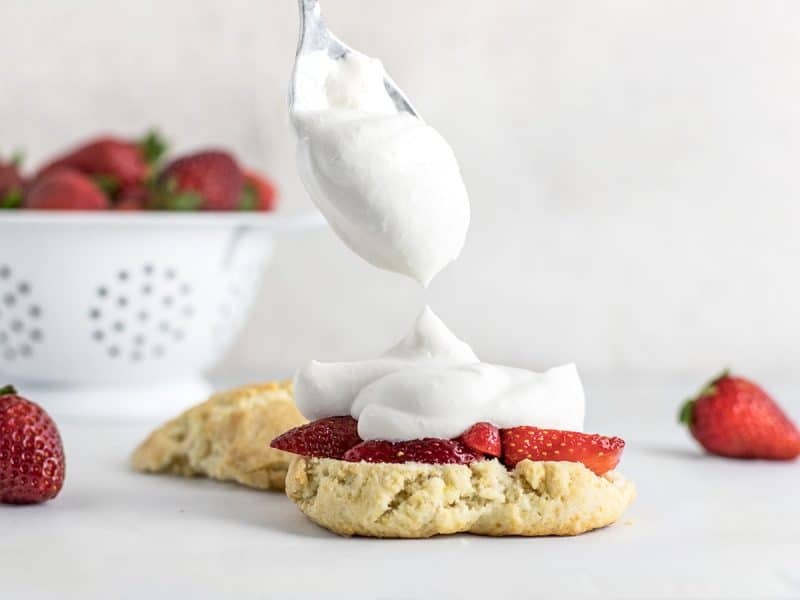 Top with a large dollop of whipped cream, then the top half of the biscuit. 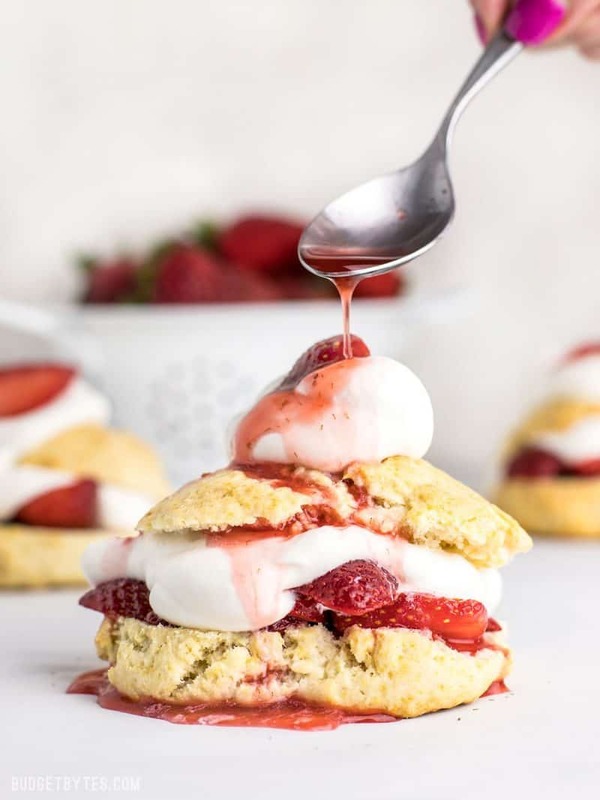 Finish each stack off with one more dollop of whipped cream, a few strawberry slices, and a drizzle of the strawberry syrup. 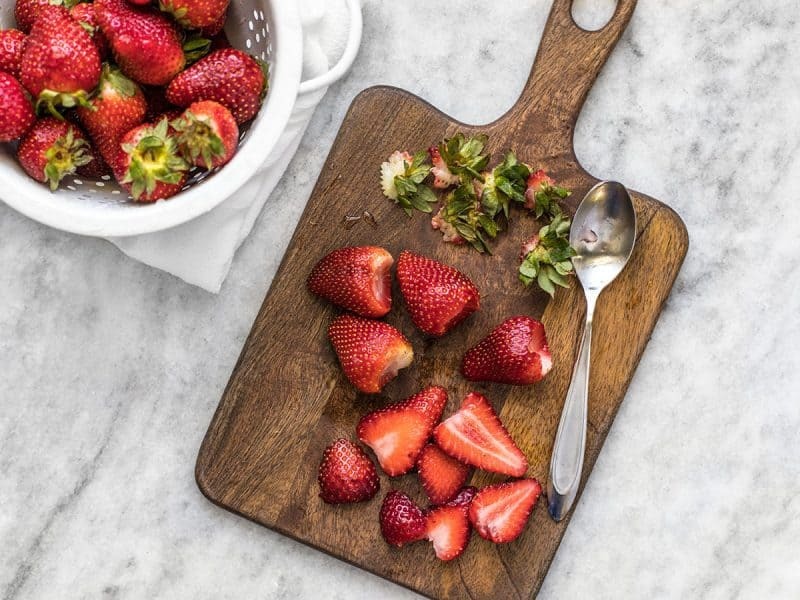 Start by rinsing one pound of fresh strawberries. Remove the stem and leaves by scooping them out with a spoon (this wastes less than just slicing off the top of the strawberries). Slice each strawberry into about four slices. 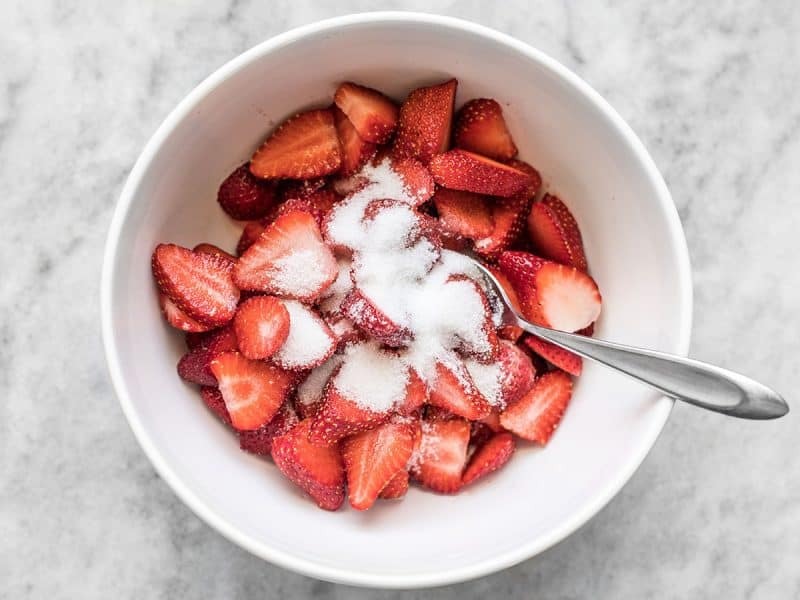 Place the sliced strawberries in a bowl and add 2 Tbsp sugar. Stir them together, then set them aside. The sugar will draw the juice out of the strawberries as they sit and create a strawberry syrup. You’ll want to stir the strawberries occasionally as you are preparing the rest of the dish. Next, start making the biscuits. Begin preheating the oven to 400ºF. 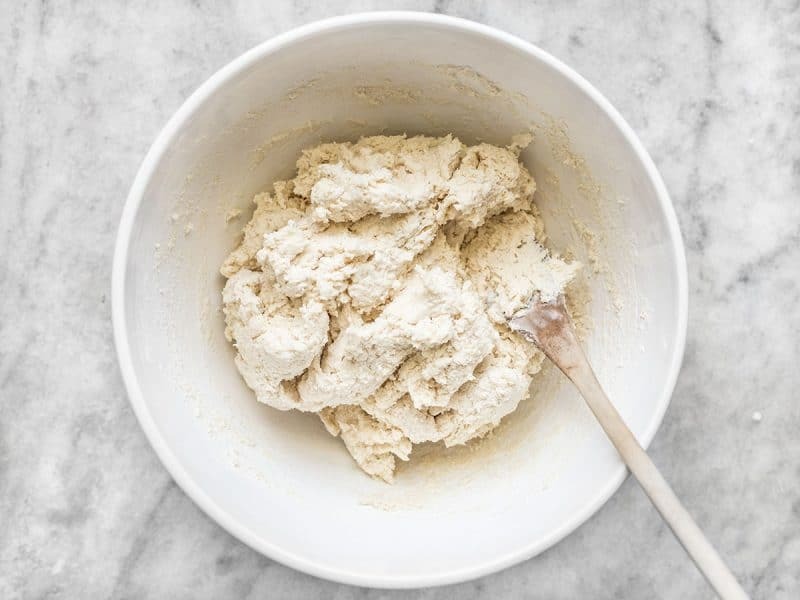 In a bowl, stir together 2.5 cups all-purpose flour, 1 tsp salt, 2 Tbsp sugar, and baking powder. Once they’re evenly combined, pour in 2 cups heavy whipping cream. 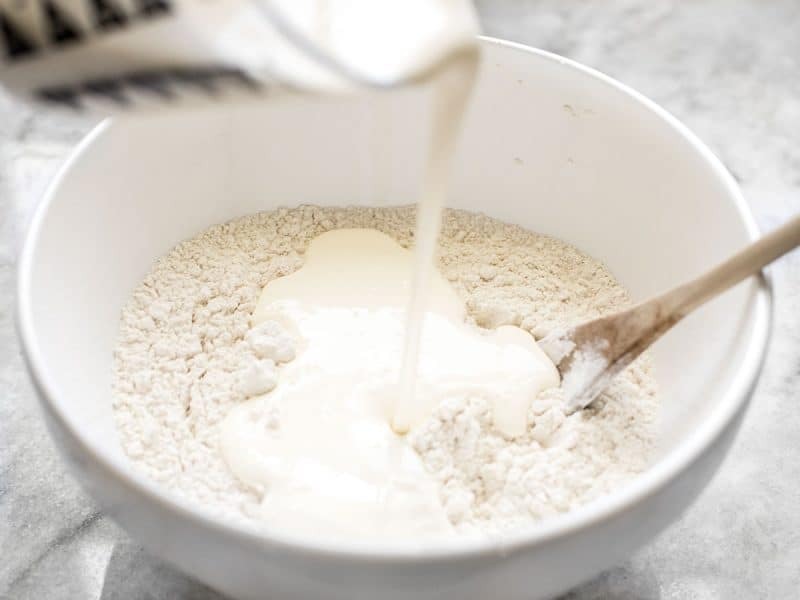 Stir until a sticky ball of dough forms and there is no more dry flour left on the bottom of the bowl. Dust your hands with flour, then divide the dough into eight pieces. Roughly shape the dough into rounds. You want them to be fairly thick. Place them on a baking sheet covered in parchment paper. Bake them in the preheated oven for about 25 minutes, or until they are lightly golden brown. Let them sit for a few minutes, or until they are cool enough to handle. 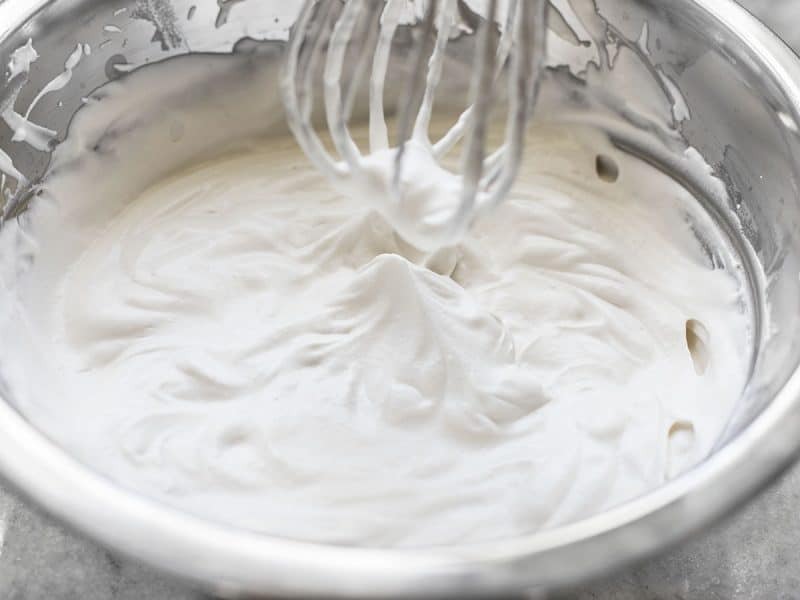 While the biscuits are baking, make the vanilla whipped cream. In a glass or metal bowl, combine 1 cup heavy whipping cream with 2 Tbsp sugar and 1 tsp vanilla extract. Vigorously whisk by hand or use a mixer to whisk until soft peaks form. Soft peaks are when you pull the whisk out and it forms a peak that slouches over to the side instead of standing straight up. It is possible to over whisk the cream and make it “break” or separate, so don’t go too far. Carefully slice the biscuits in half (they’re very tender and crumbly, so take care). See how much juice has come out of the strawberries as they sat? That syrupy juice is key. Place a layer of strawberry slices and some of that delicious strawberry syrup on the bottom of each biscuit. 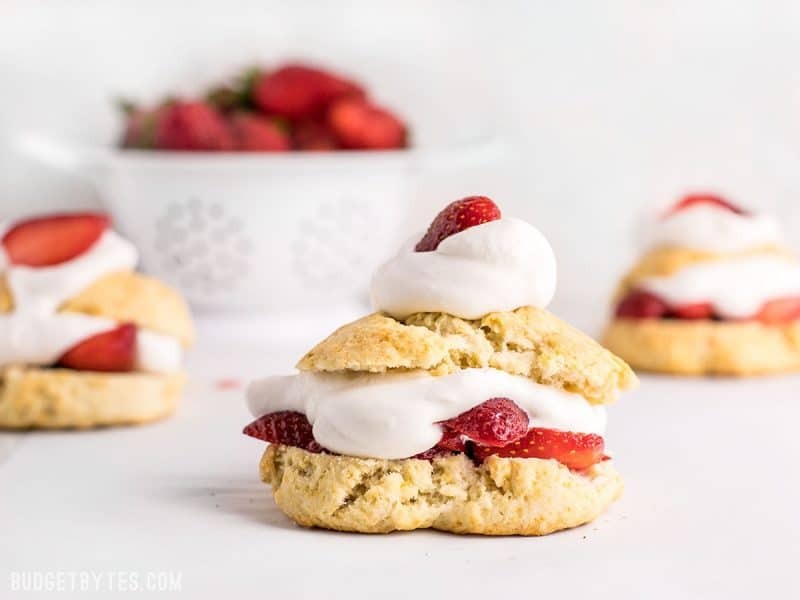 The post Strawberry Shortcake appeared first on Budget Bytes.